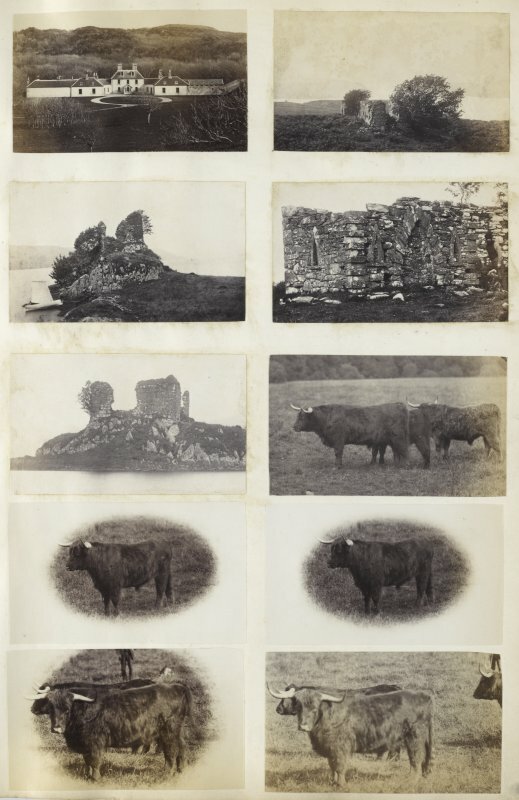 View of ten small photographs variously identified; the top five images are variously identified buildings or ruins and the lower five images are of highland cattle. Of the identifiable buildings, the upper-left image is a view of the front of Colonsay House, Colonsay, Argyll. 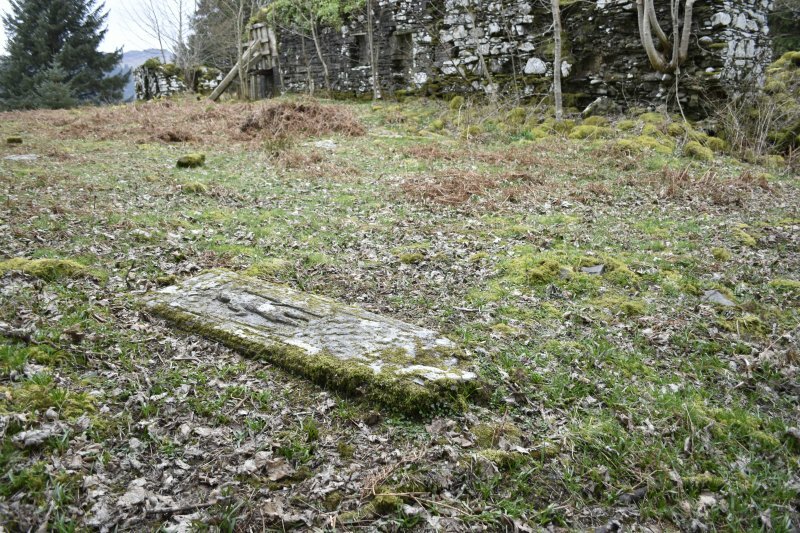 The upper-right image is a wide view of the ruins of a medieval parish church, dedicated to St Columba, known as 'Kilneuair Chapel', at Kilmichael Glassary, Argyll. 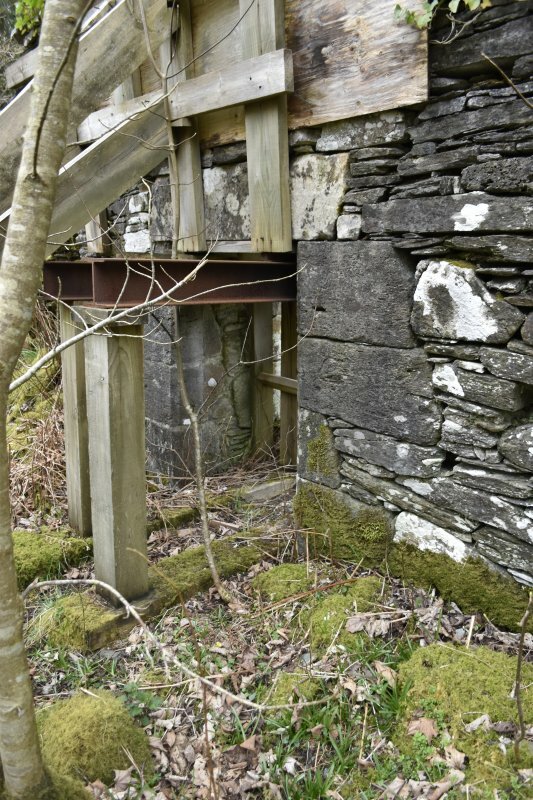 The upper-central left image is a view of a boat moored at the Fincharn Castle ruins on the south end of Loch Awe, Argyll. 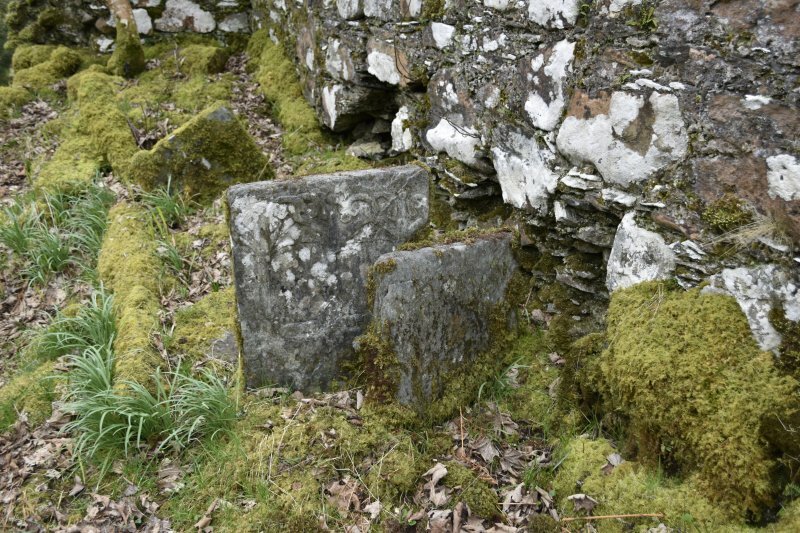 The upper-central right image is another, more detailed, view of the ruins of a medieval parish church, dedicated to St Columba, known as 'Kilneuair Chapel', at Kilmichael Glassary, Argyll. 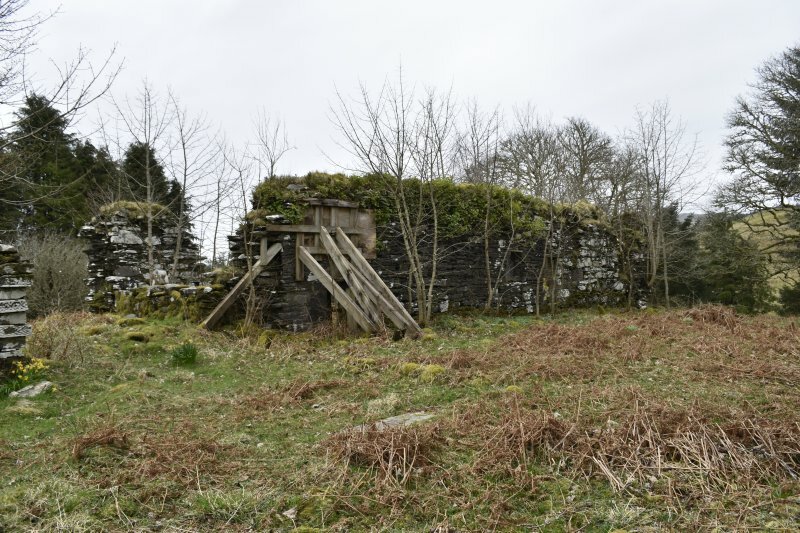 The central right image is another, more detailed, view of the Fincharn Castle ruins on the south end of Loch Awe, Argyll. PHOTOGRAPH ALBUM No. 187, (cf PAs 186 and 188) Rev. J.B. MacKenzie of Colonsay Albums,1870, vol.2. The remains of a medieval parish church, dedicated to St Columba, with an oratory close by stand in the churchyard which was still in use as a burial ground at the end of the 19th century. Of fine workmanship, the church is longer than is usual in the area, with two doors on the south side. There is a damaged table-tomb north of the altar site and a piscina with a trefoil arch. 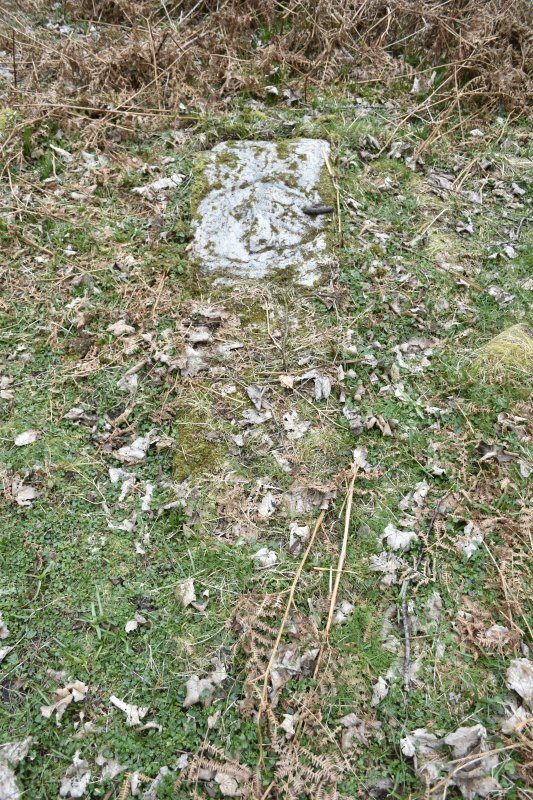 A font, now erected at the west end, was found in three parts nearby. Inside, to the east of the nave door, is a sandstone block bearing a now almost invisible five-toed print with nails on three of the toes and which is referred to as 'the Devil's hand'. 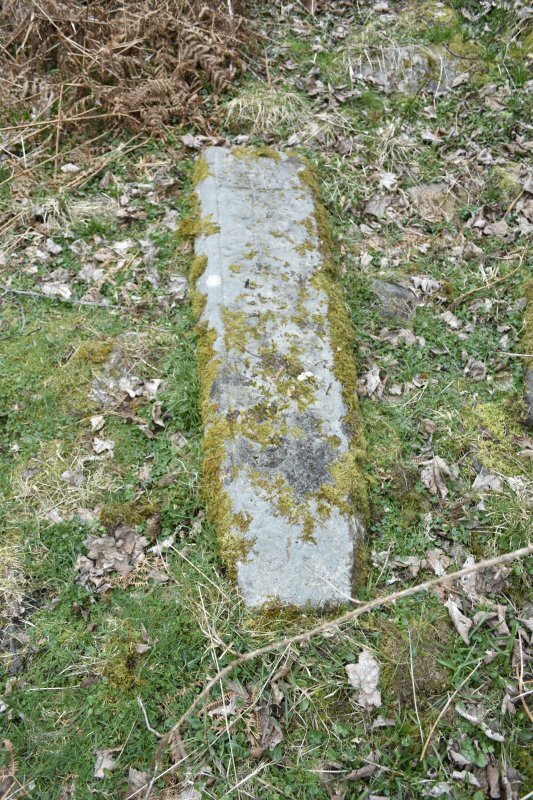 The name 'Kilneuair' which is applied to the site (Kilnewir, 1394; Killenevir, 1490; Killenure, 1671) suggests an earlier church, and an older, roughly circular enclosure can be traced inside the churchyard wall, especially on the west and north. Campbell and Sandeman (1964) translates 'Kilneuair' as 'Coille-nan-Iubhair', ie 'Yew Wood' and suggests that this may be the Columbian site 'Cella Diuni' mentioned by Adomnan, which was certainly in the Loch Awe area and has not hitherto been identified. 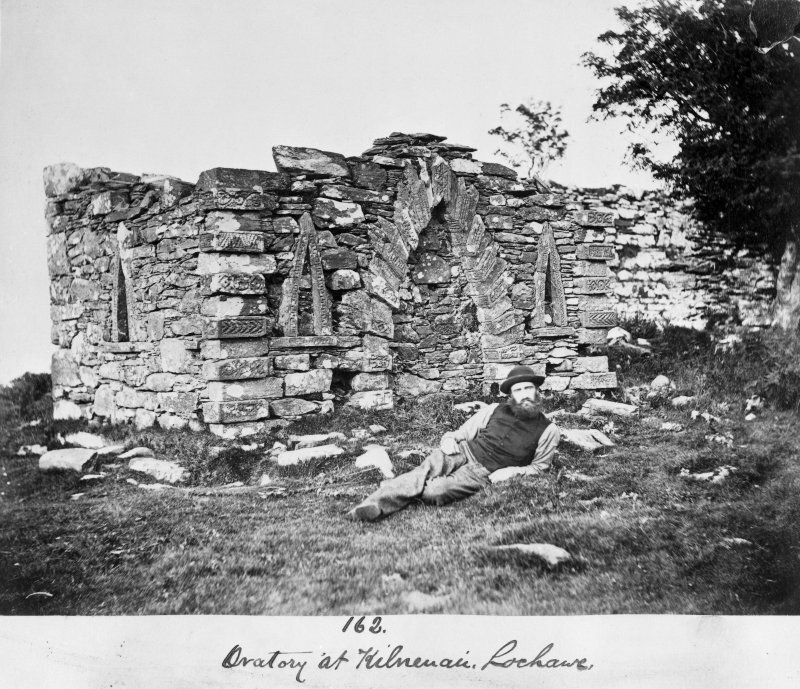 A village once lay round the church and a market, called 'A' Margadh Dubh' - 'the Black Market' - perhaps in contrast to the gaiety of Kilmichael Tryst, was held here. There are a few house ruins outside the graveyard. Visited by OS (W D J) 2 March 1970. 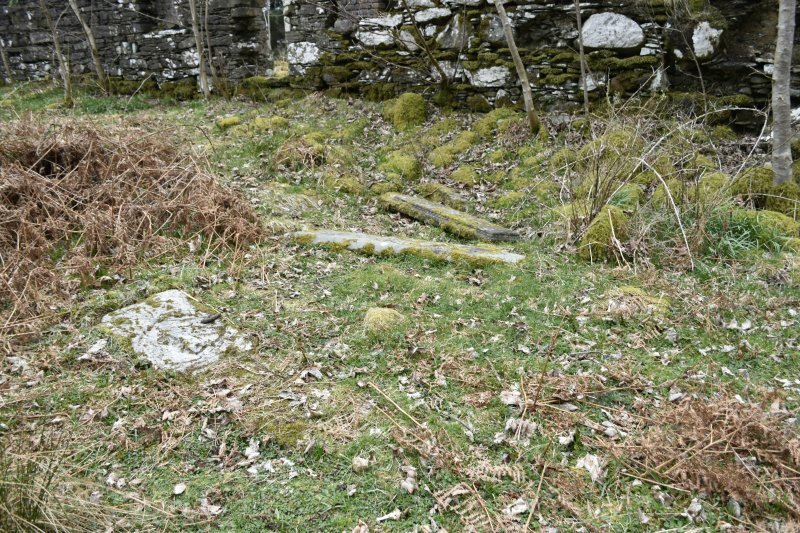 The remains of the medieval church of Glassary parish occupy the N edge of a flat-topped knoll bounded on the E by a small stream, 180m from the SE shore of Loch Awe and 1.1km SW of Fincharn Castle (No. 130). The wall of the existing pentagonal enclosure is of 19th-century date but within it, especially to the S, there are intermittent traces of a turf-covered bank which may have enclosed an area about 45m in diameter. Outside the enclosure to the W there are footings of about four subrectangular buildings, probably associated with the former township of Kilneuair (en.1). A major drove-road from Lochaweside to Loch Fyne (No. 274) ran close to the site, and an annual cattle-market is said to have been held there until the 18th century (en.2). In its present form the church measures 21m from E to W by 5.6m within walls about 0.9m in average thickness. Whereas the S wall and the W half of the N wall stand to heights of over 4m, the Wend-wall is almost totally demolished and parts of the remaining walls are much reduced in height. A large tree is growing at the NE angle, and much of the masonry in this area is in danger of collapse. The fabric of the building indicates three main periods of construction. The present chancel, with the entire E half of the N wall, is composed of reasonably well-coursed rubble-masonry incorporating many rounded boulders and rising at the E end from a 0.lm scarcement. The W half of the N wall has masonry of fairly similar character, but showing less consistent use of pinnings to achieve regular courses. The greater part of the S wall, however, from a point 6.9m from its E end, was rebuilt, probably in the 16th century, with thin slabs of local schist. This masonry includes some sandstone dressings, probably re-used from an earlier phase, and some moulded epidiorite dressings in the SE door are definitely in re-use. It also incorporates, at a height of about 1.6m in both the inner and outer faces, a series of small sockets, probably putlog-holes for scaffolding. The chancel was lit by a tall two-light window whose splayed S ingo survives to a height of 1.9m, although only the lowest rybat of the N ingo of the N light remains in situ. The embrasures of this window, and of another one in the S wall, had flat sills, but their outer dressings are destroyed. A second window in the S wall, which may originally have lit the E end of the nave, was blocked by the 16th-century rebuilding, but its E ingo is identifiable some 6.8m from the SE angle of the chancel. 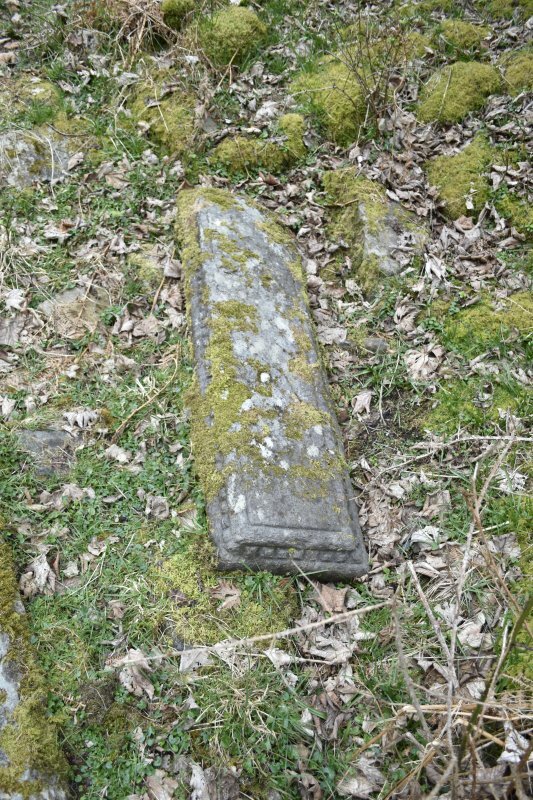 At the E end of the S wall there is an aumbry, and to the w of it a damaged piscina of epidiorite having a trefoil-cusped head wrought with a 40mm chamfer. These features appear to relate to a floor-level at least 1mabove that of the 16th-century nave, but this discrepancy was probably found in the original arrangement since the sill of the blocked window described above was at a lower level than those of the chancel windows. In the early 16th century a tomb-chest (infra, number 4) was constructed a little to the W of the piscina, and presumably at the foot of the altar steps; its upper slab has been displaced, but a rough groove to house it is identifiable in the adjacent wall. Although the 16th-century S wall provides the main evidence for the late-medieval arrangement of the interior, its overall length and the division between nave and chancel were established in the intermediate period represented by the W half of the N wall. 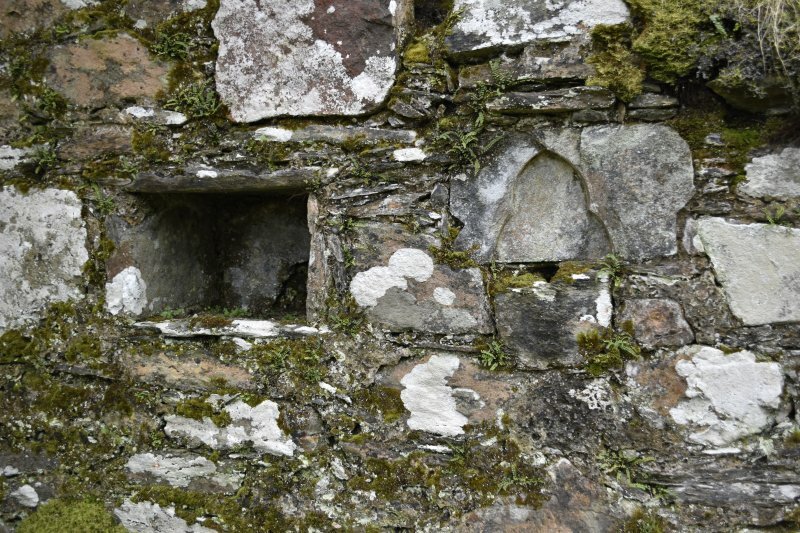 The only feature of this wall, a large but damaged aumbry 10.9m from the E wall, corresponds in position to a window in the rebuilt part of the S wall, and both features were probably associated with nave-altars set against a timber chancel-screen. The outer jambs of the window do not survive, but the sill and lintel preserve its 0.3m daylight-opening, wrought with a 40mm chamfer and a glazing-groove, and having sockets for a vertical stanchion. Its splayed embrasure is flat-lintelled, with a double-stepped sill, and the rybats of the E jamb are of sandstone, probably in re-use. Similar material is found in the W ingo of the adjacent doorway, which gave access to the W end of the enlarged chancel. This opening, which has a chamfer of 60mm on the external jambs but only 30mm on the flat lintel, also incorporates two re-used window-rybats of epidiorite in its E jamb. It has a high outer threshold and two steps down to the interior. The nave doorway, towards the W end of the S wall, has similar 60mm-chamfered jambs, the W jamb being displaced and in imminent danger of collapse. The lintel of carboniferous sandstone, which is unchamfered, bears a central sunken equal-armed cross with expanded terminals, 120mm across the arms, and above this are weathered traces of an apparent black-letter inscription occupying the full width of the lintel (en.3). Natural markings on the N face of one of the rybats of the E ingo of this doorway are celebrated in local tradition as the imprint of 'the devil's hand' (en.4). The chancel of the existing church may be ascribed to the13th century and if, as appears likely, the piscina is an original feature, probably to the second half of that century. 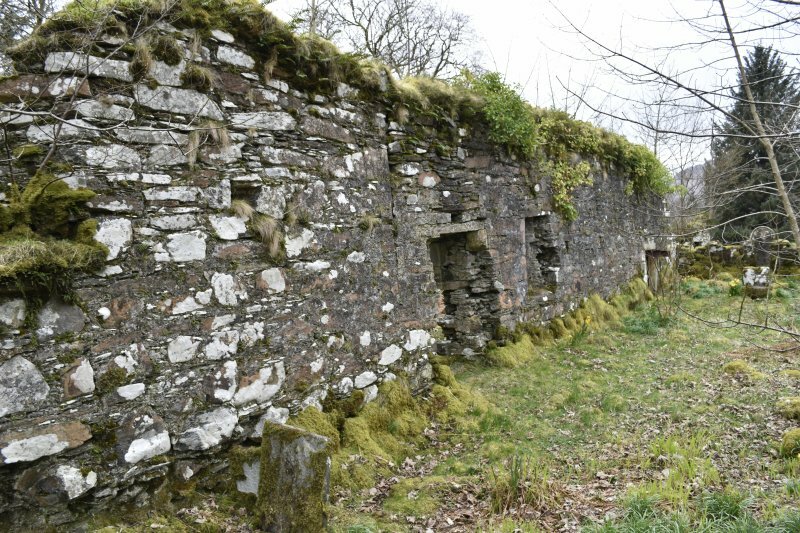 The position of the original W wall is uncertain, and although by that period there were churches of comparable length in Kintyre (en.5), it is probable that Kilneuair was extended at a somewhat later date. The rebuilding of the S wall is of early 16th-century character, and its application to part of the chancel as well as the nave may reflect the position of members of the Scrymgeour family both as rectors and local landowners (infra). The only indications of post Reformation alteration are two apparent sockets in the S wall of the church, which may have held the supports of a gallery, but the damaged condition of the masonry makes their identification doubtful. 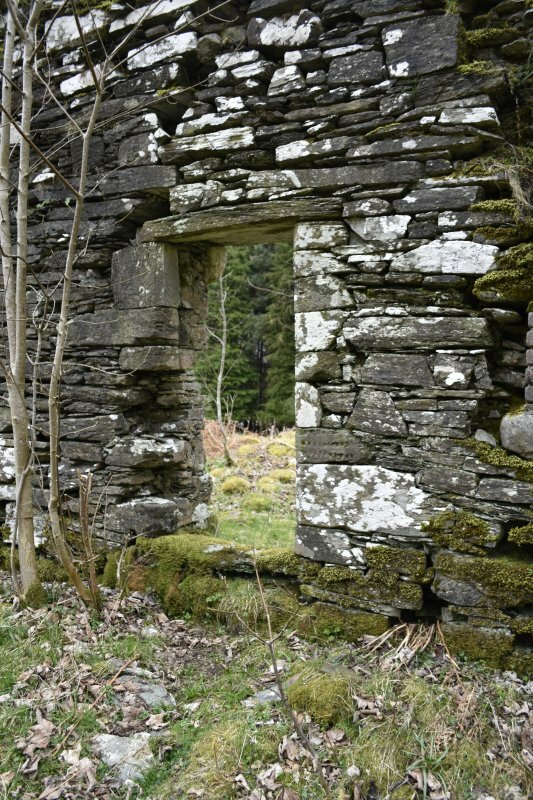 Until at least the 16th century this was the principal church of the extensive parish of Glassary, which included the SE bank of Loch Awe and the NW shore of Loch Fyne from Loch Gilp to the Leacann Water. 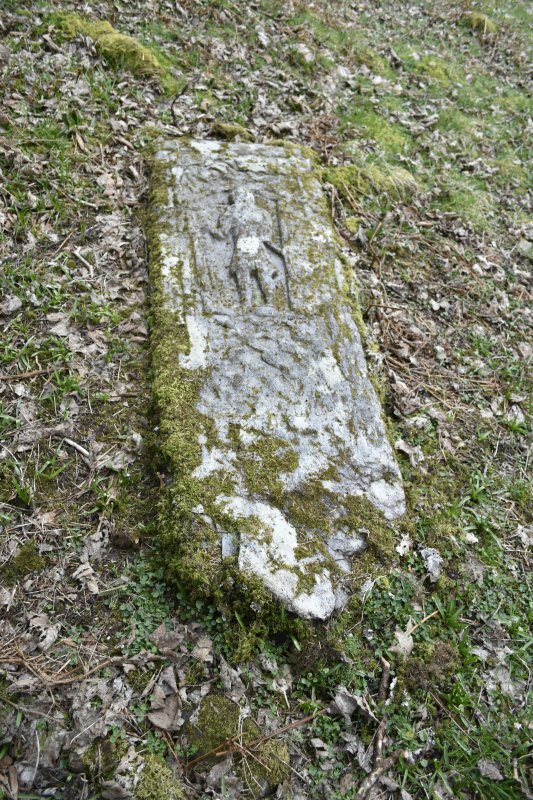 The name 'Kilneuair' (Cillan Iubhair, 'church of the yew tree') is first recorded in1394 (en.6*), but most medieval references were to 'the church of St Columba in Glassary'. The parish contained several chapels (see Nos. 52, 54, 63, 69, 77), and in 1420 the maintenance of two chaplains was described as a charge on the income of the rector (en.7*). The Scrymgeour lords of Glassary (see No.130) retained the patronage of the rectory even after it became a prebend of the cathedral of Argyll on Lismore in or shortly before 1432, and members of the family held the offices of rector and vicar for much of the 15th and 16thcenturies (en.8). The replacement of Kilneuair by Kilmichael Glassary (No.69) as parish church is poorly documented, although the collation of a vicar to the former is recorded in 1559 (en.9). 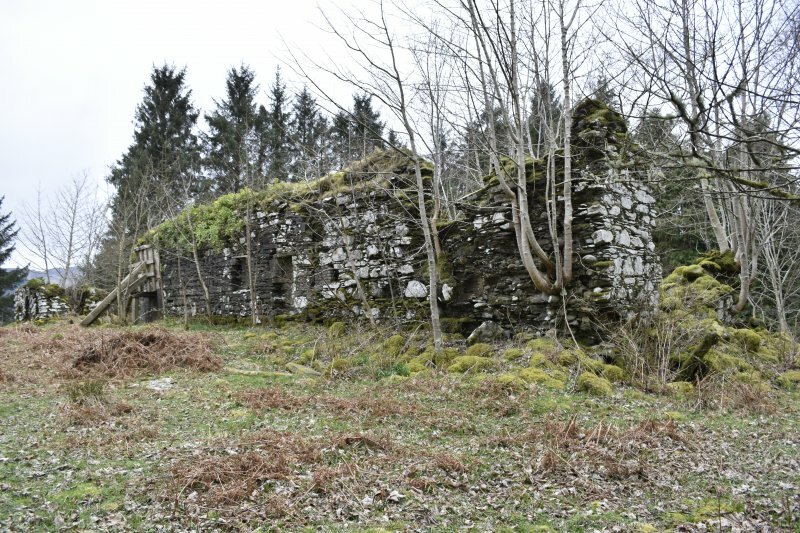 By the early 17th century Kilmichael was recognised as the principal church, and although the Synod of Argyll attempted in the1640s and 1650s to establish Kilneuair as the centre of a separate parish, it is evident that in 1656 no adequate church building existed there (en.10*). FONT. 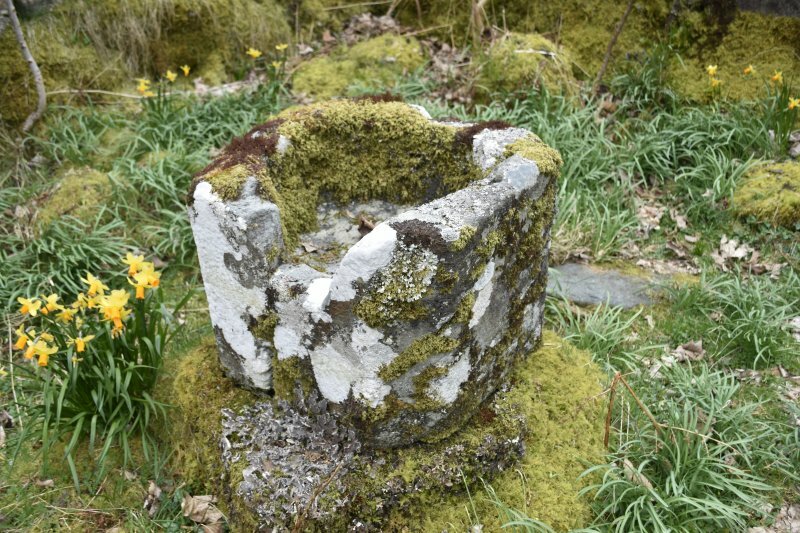 This medieval font is said to have been removed from the church, but by 1916 it had been re-erected in its present position at the W end of the nave (en.12). It comprises a block of epidiorite, 0.56m square with bevelled angles, and 0.42m high, incorporating a circular basin 0.41m in diameter by 0.19m in depth. The basin has a central drain-hole, and in the top edge there are two small sockets for metal fittings to secure the lid. A deep notch cut into one side of the basin is perhaps the result of later domestic use. The font stands on a slab of corresponding plan, 0.13m in height, which may have been its original plinth, and this in turn is carried on a re-used millstone, 0.9m in diameter and 0.13m thick.